Travelling with an infant or toddler is always, shall we say, an adventure. And sometimes on that adventure we find ourselves staying in hotel rooms, which are generally ill equiped to support the lifestyles of us with young kids. To help you make the most of your hotel stay we’ve pulled together some brilliant tips and tricks. From how to use your room to its full potential, to what gear you might want to bring to keep everyone comfortable and safe. It’s not ideal but with a little know-how you can convert your hotel room into a functional space for babies and toddlers. 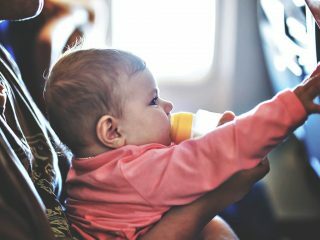 Before you head out on your trip, make sure you pack all of the supplies your baby or toddler needs for eating, sleeping, clothing, and bathing. Pack twice as many baby clothes to account for accidents and messes (I mean, baby clothes are tiny, you can fit a lot in a travel bag). Unfortunately not everything is as easy to travel with. It’s not going to be practical to bring ALL your normal baby gear. You’re going to have to make some tough decisions. While it may be tempting to rely on hotel facilities for things like bathing, that’s not always a good idea. In some cases it makes more sense to buy special items designed for travel. For example you can get a special travel bath tub that folds flat and can easily fit into your luggage. The Puj Tub is a great option for traveling. It’s foldable and lightweight for easy packing and storage! 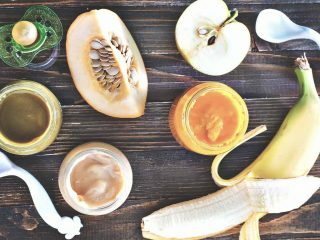 You should also stock up on some space-saving travel baby products beforehand – things like body wash, diaper cream, and if you are bottle feeding, the smaller can of formula. Count out how many diapers you will need, based on your baby’s current routine and bring extra. Or, to save room in your suitcase, find a local drug store or grocery store near the hotel to stock up on diapers and baby food once you arrive. You could also look into this tip by Travel and Leisure and have your diapers shipped to the hotel, waiting for you in the room when you arrive. Genius. 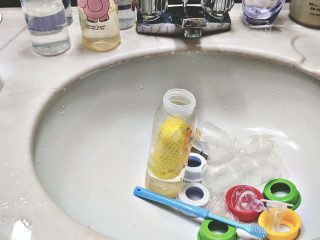 Be sure to bring plenty of plastic bags for stashing dirty diapers, separating dirty clothes from clean clothes, and keeping your bottle supplies together. If you forget, no worries, you could always use the ice bucket liners or plastic laundry bags in the room itself. You would be surprised at the number of clever hotel room hacks you can come up with when traveling with a baby. Taking some time to call the hotel will give you the lay of the land before you arrive. You can find out about the tub, sink, and crib situation. Then, you can know what you need to pack or adjust, depending on the age of your baby or toddler. Most hotels have cribs or pack-n-plays available for families. Knowing these things beforehand could really help keep your luggage from overflowing. If you have concerns about a hotel crib being clean or unsafe, you could opt to bring your own pack-n-play. Or, you could pack some extra crib sheets instead. You save the hassle of extra gear, but you have the clean space between your baby and the crib mattress. Once you arrive at the hotel, make friends with the housekeeping staff. You can request extra pillows, towels, and trash can liners. It’s better to request them BEFORE you need them so you aren’t dialing room service at 2AM after an extra explosive blow out. You can use the pillows for a toddler bed rail, towels for a changing station or to block light, and trash can or ice bucket liners for dirty diapers. If you are traveling with breast milk you can also help yourself to the ice machine to keep everything nice and cold. Just like at home, parents want to create an optimal environment for everyone to get some sleep. If possible, you might pay a little extra to get a suite. Suites have more room for a quiet space for sleeping and a hang out spot for parents who aren’t ready for bed. Surrender the bathroom. Just do it. However, if a suite isn’t in the budget, you could always put the crib in a closet with a little sheet barrier to block out the light. You could also, “Surrender the bathroom” for the greater good. You could put the baby crib in the bathroom and use the hotel lobby bathroom for tooth brushing and bathroom emergencies in the night. Remember those extra towels you requested? Use them and the office desk in the room to create a baby changing station. You could also just use the towel on top of the bed, but having a dedicated station helps keep everything in the room tidy and under control. Here’s a simple trick to quickly baby-proof your hotel room. Bring a roll of blue painter’s tape to cover up outlets, pad sharp corners, keep curtains closed, etc. It peels off without damaging anything, and it packs well. I like this tip of getting down to your baby or toddler’s height to do a sweep of the room. Look for uncovered outlets and exposed cords. Make sure the television is secure, and the coffee maker remains unplugged until you need to use it. To avoid messes, gather up all of the loose items (think complimentary toiletry items) and put them in a drawer. Stash the trash can out of reach. Tape up the mini fridge to keep curious toddlers at bay. Creating an optimal sleeping environment does you no good if you have housekeeping or management knocking on your door. Use the Do Not Disturb sign while you are in the room, and talk to the hotel staff about scheduling your room getting cleaned when you know you will be out. Don’t be embarrassed about requesting this. Most people understand that babies need naps. We found that not having the freedom to eat out every night was one of the hardest things to get used to when traveling with a baby. But just because you can’t sit in the restaurant, doesn’t mean you have to resort to bad room service. Make a list of restaurants that you want to try while on your trip and celebrate the beauty of take out. You could call in an order while you are out exploring and pick it up before heading to the hotel for early bedtime. Or, even better, you could use a service like Uber Eats, DoorDash, or GrubHub to have dinner delivered. Don’t limit yourself to expensive room service. 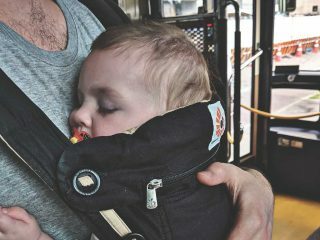 You can still explore the local flavors of the city and have kids get reasonable sleep. You’re living your best life! Note – Some hotels have policies against food delivery so make sure you check this. Or one of you could go out on the street to pick up the food. One of my favorite parts of parenting is figuring out hassle-free ways to still do “before kid” activities. 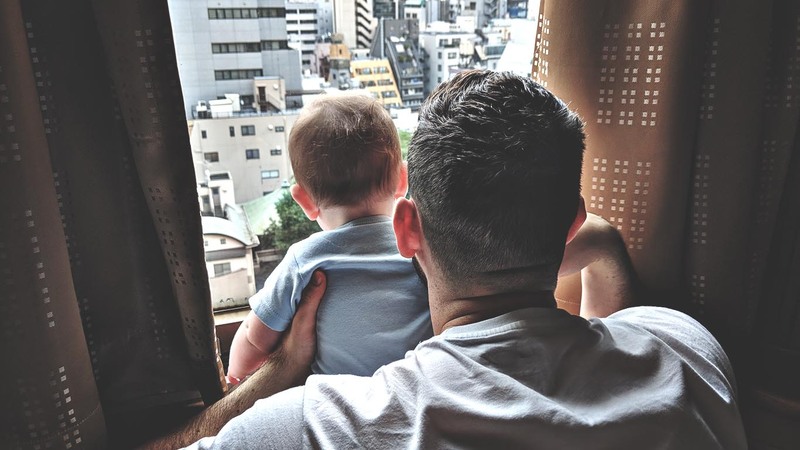 I love reading about tricks and hacks before heading out on my own adventure, and I hope this list helps you as you prepare to tackle the hotel with your baby. Have you learned any new tricks for staying at a hotel with your kids? Go to the comments section and share. As always, share this article if you like it!